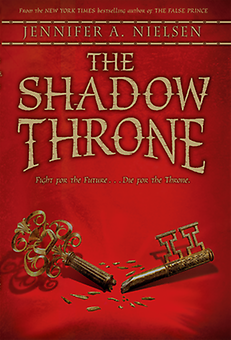 “The Shadow Throne” is the final novel in Jennifer A. Nielsen’s fantastic Ascendance Trilogy. The series centers on Prince Jaraon aka Sage, a teenager who is forced out of hiding (“The False Prince”) to take over as king following the death of his family. Jaron was a wild, mischievous child who never took royal duties seriously. Now king, he has a hard time convincing the people who watched his antics that he is the right person for the job (“The Runaway King” and “The Shadow Throne”). As “The Shadow Throne” opens, we find Jaron’s kingdom on the brink of war. Jaron has his own ideas on how to bring peace back to the land, but not everyone trusts his instincts. It’s at this point that Jaron must prove he’s not a figurehead but the true king of Carthya. I’ve loved this series from the first chapter of “The False Prince.” Author Jennifer A. Nielsen set the bar high for her ensuing novels. “The Runaway King” faltered a tiny bit. Jaron remained the star of the show, but supporting characters weren’t as fleshed out as I would have liked. Picking up “The Shadow Throne,” I found myself immediately drawn back to the characters and story I initially loved. Jaron’s growth is the most obvious. He is more humble and willing to listen and work with others, though that may not be apparent at first glance. The people who surround him have also taken on more dimension — their personalities really add substance to the overall feel of the book. As with the other novels in this trilogy, “The Shadow Throne” features adventure, mystery and suspense. There are also a few plot twists here that may have young fans gasping. Keep in mind this is a novel that takes place during war, and as such, violence (battle, torture, etc.) plays a role. That said, the author keeps the detail and gore to a level suitable for the publisher’s suggested age range (10 and up). “The Shadow Throne” is a strong and well thought out end to an exciting series. I can’t wait to see what the author comes up with next. Ahh, I loved this trilogy! So much fun. I’m going to be taking a plotting workshop from Jennifer Nielsen this summer, which I’m sure will be just awesome:). That woman knows how to plot a good book. Also, congratulations on your beautiful baby girl. I’m glad you’re feeling better!